the largest retailer of used & out-of-production LEGO® sets. Timeline of 20 Years of LEGO Star Wars at SWC 2019! 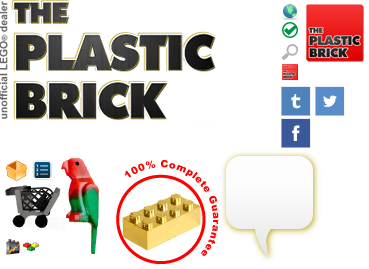 ThePlasticBrick.com	pays for a wide variety of used, vintage and unopened LEGO® brand sets. It doesn’t matter if you have all the pieces, instructions or boxes. We pay the shipping and do all the work to make it easy on you. You will always get a price that is based on fair market value. If you are interested in selling your used LEGO® set(s), please visit our Sell Form. Look for the 100% Complete Guarantee logo on the Plastic Brick. Our guarantee lets you be confident that you will receive all the pieces that should be in your sets. Although mistakes do happen occasionally, you can be sure that The Plastic Brick will respond quickly to any mistake and make sure that you are satisfied with your purchase.